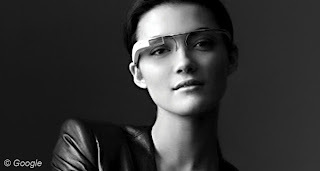 Google has revealed details of some much talked about spectacles which will allow users to interface with the web. In a post on its social network site Google+ the company gives an introduction to its new venture which it calls Project Glass. The site showcases a number of photos of users wearing the minimalist designed spectacles and a video which is also posted on YouTube. As anticipated in reports that surfaced in February [tvnewswatch: Google may release glasses with HUD] the glasses sport a Heads Up Display [HUD] which gives the user directions to requested locations and alerts the wearer to travel delays, weather and incoming calls. The augmented-reality glasses, as they are being described, are the culmination of a two-year initiative called Project Glass, developed in the clandestine Google X laboratory, near the company's main campus in Mountain View, California. But now the general public are being asked for their input and opinion on the proposed device. "We're sharing this information now because we want to start a conversation and learn from your valuable input," a message on the Google+ website states. The glasses will likely be tied into the whole Google+ experience enabling users share information with their circles directly, such as pictures, check-ins and other data. It also features Siri like functions, which Apple users may already be familiar with, enabling the user to set reminders and ask questions. If the device works as well as the video shows, the glasses could prove to be a real game-changer in the way people interact with the web on the move. It is believed the gadget will incorporate Android software and will utilise a 3G or 4G data connection, motion sensors and GPS navigation. The project is still in its early days and there is no word as to when the Google glasses will become available or what the retail price might be. The New York Times had previously suggested that the first set of glasses would go on sale before the end of the year for somewhere between $250-$600 [£157-£378]. However, some experts say the technology shown in the video may still be some way off being ready for market [BBC / Sky / CNN / Telegraph / Guardian / Daily Mail / WSJ].